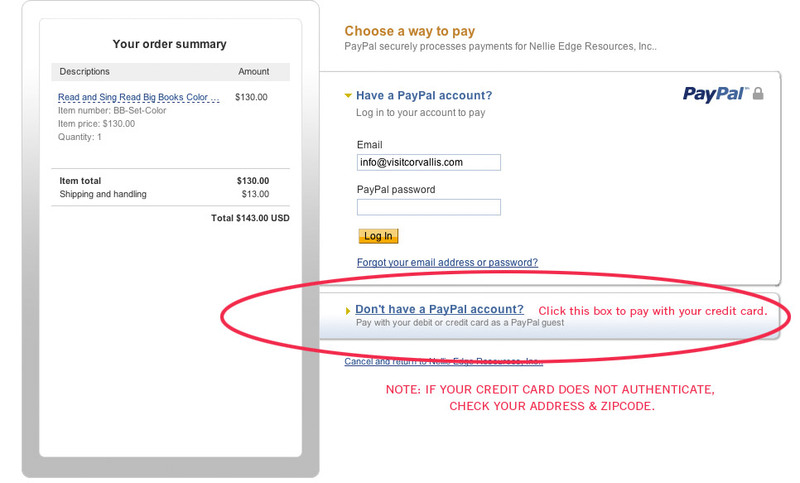 Nellie Edge Online Seminar #2. Downloadable version available NOW on TPT! Nellie Edge Online Seminars Members - These are INCLUDED in your registration along with 2018 updates. Detailed, 115-page spiral bound Teachers' Guide. A-Z student practice book of writing templates with cover page and assessments integrated. One (1) bound sample student notebook included. 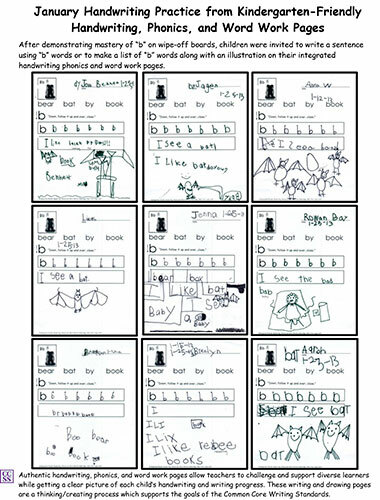 95% of the writing students do is with lowercase letters: most of the 33 practice pages are for lowercase letters, designed in a writing to read format with real words and sentences. 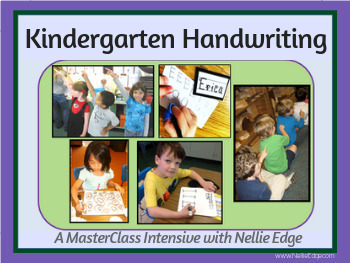 Kindergarten Handwriting MasterClass with Nellie Edge in a step-by-step Power Guide reflecting this program as a Live Workshop by Nellie Edge. Gift Folder: includes assembled Parent Name Writing Practice Book and enlarged Little Books for writing friend’s names. 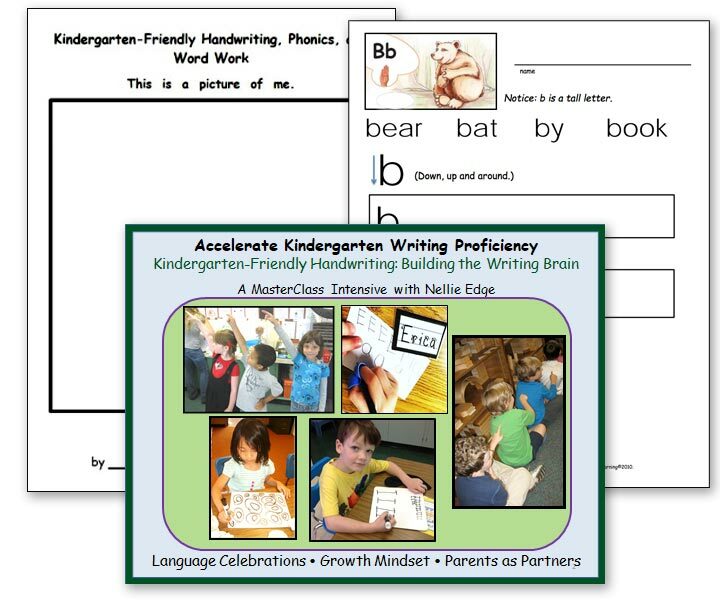 We recommend that teachers use this Kindergarten-Friendly™ Handwriting, Phonics, and Word Work program as a part of a comprehensive writing framework in tandem with authentic word work activities and engaging literacy lessons. We introduce the expectation of good handwriting to children and parents from the first days of school with daily name writing practice. 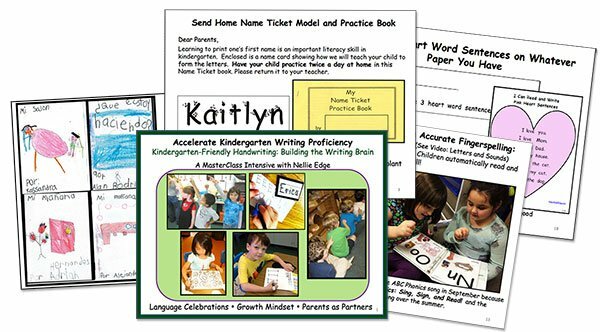 (We send “Name Ticket” practice books for families to use at home.) In addition to individual work on names, we provide whole group handwriting instruction through multisensory songs and chants with movement patterns and fingerspelling using powerful high-frequency “heart words”. 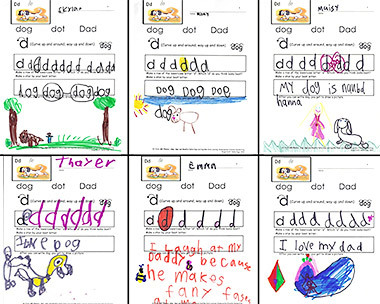 We begin with “I”, “love”, “you”, “Mom”, “Dad”, “cat” and “dog”. Our integrated literacy lessons use wipe-off boards as teaching tools and independent writing centers to practice handwriting skills in an authentic context. (We write messages and books!) Our purpose is always to incorporate handwriting into authentic writing experiences—and not isolated drill. Whole group beginning lessons focus on teaching basic handwriting motions, directional language, awareness of shapes, and seeing like an artist. Instruction transitions into small group, differentiated lessons using the children’s individual a-z writing and drawing books. 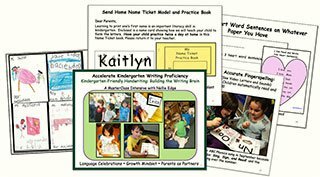 Every teacher chooses the timing and instructional framework that works best for their unique group of individual learners; some teachers wait to use the actual a-z writing and drawing book as a whole class review as late as January, giving special attention to the less experienced writers.